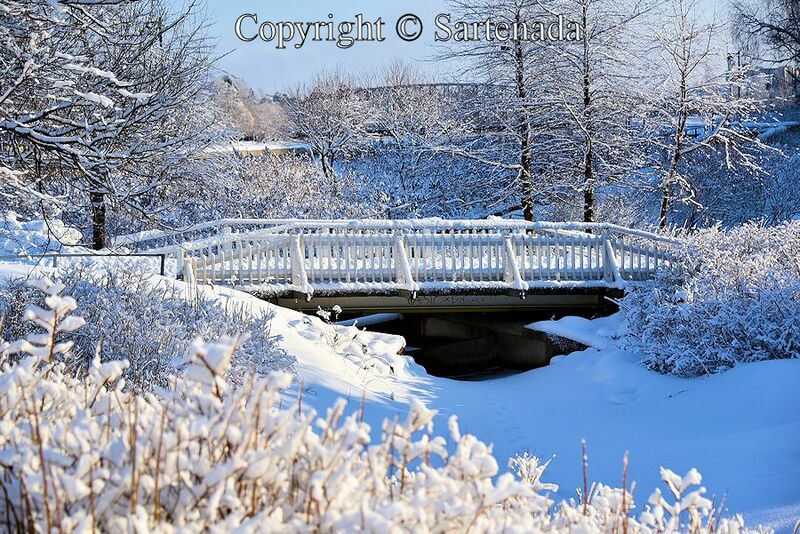 White bridges of Hupisaaret in Oulu in winter. 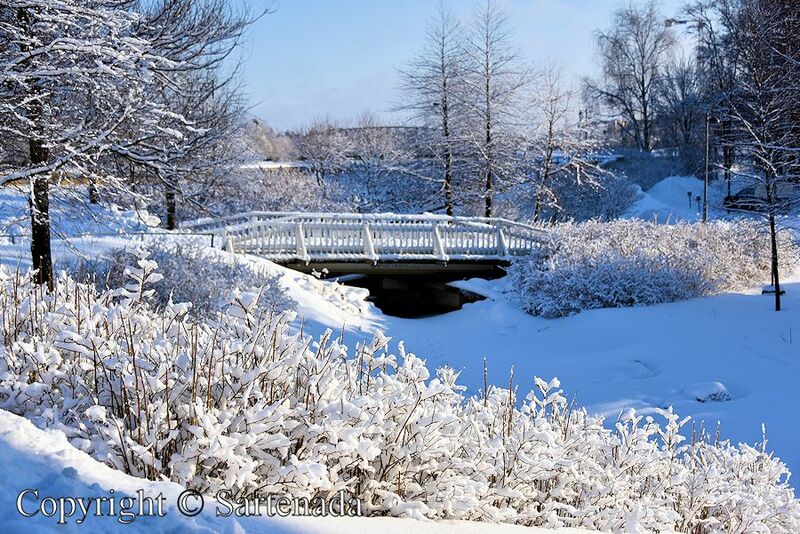 Hupisaaret, freely translated means “Fun Islands”, is a recreation area in the center of Oulu, consisting of many islands, which connect to each other by white bridges. Between these islands, there are small brooks and waterways. How to fast reach Hupisaaret from Helsinki? By air 1 hour, by rail about 5 hours and 25 minutes, by bus 8 hours and by car 7 hours. Welcome to walk with us thru my photos. My wife will show you the right path, so you will not get lost. 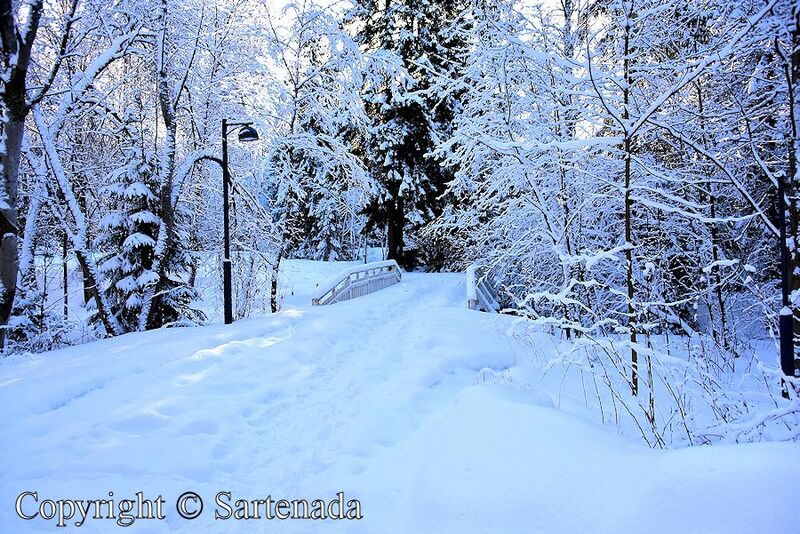 Puentes blancos de Hupisaaret en Oulu en invierno. Hupisaaret, traducidos libremente “Islas Divertidas”, es una zona de recreo en el centro de Oulu, que consta de muchas islas y que se conectan entre sí por puentes blancos. Entre estas islas, hay pequeños arroyos y cursos de agua. ¿Cómo rápidamente para llegar a Hupisaaret desde Helsinki? Por aire 1 hora, por ferrocarril cerca de 5 horas y 25 minutos, 8 horas en autobús y en carro 7 horas. ¡Bienvenido! a caminar con nosotros a través de mis fotos. Mi esposa le mostrará el camino correcto, por lo que no se pierda. 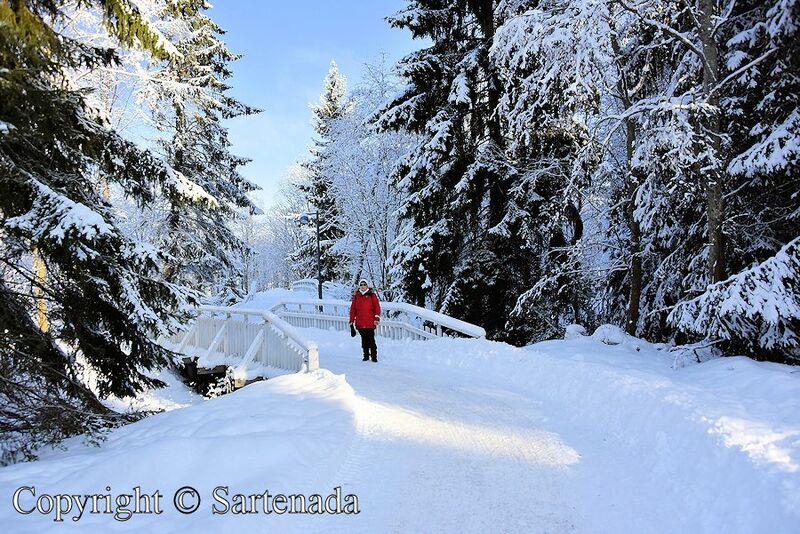 Ponts Blanc de Hupisaaret à Oulu en hiver. Hupisaaret, traduit librement “îles de joie” est une zone de loisirs dans le centre d’Oulu, qui se compose de nombreuses îles et qui sont reliées entre elles par des ponts blancs. Parmi ces îles, il y a des petits ruisseaux et cours d’eau. Combien de temps pour atteindre Hupisaaret de Helsinki? 1 heure par air, en train environ 5 heures et 25 minutes, 8 heures en bus et en voiture 7 heures. Bienvenue avec nous à promener à travers mes photos! Ma femme va vous montrer le bon chemin, de sorte que vous ne serez pas perdu. 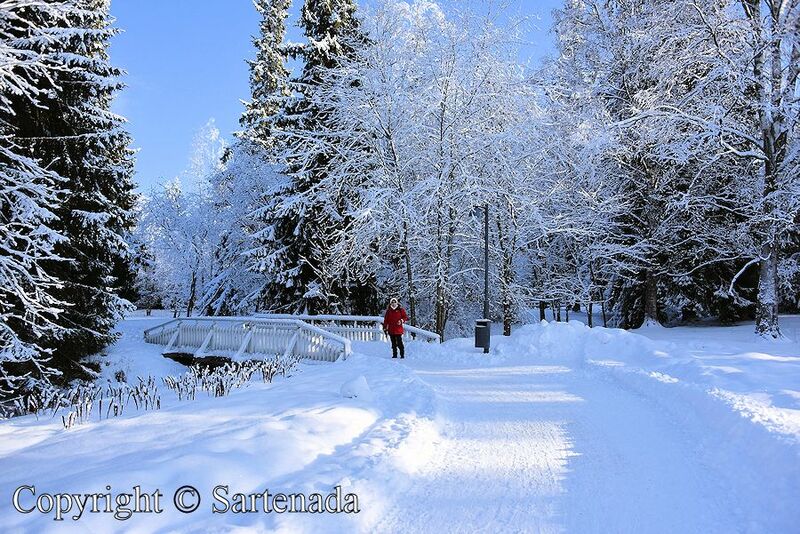 As pontes brancas de Hupisaaret em Oulu no inverno. Hupisaaret, traduzido livremente significa “Ilhas de divertimento”, é uma área de lazer no centro de Oulu, que consiste em muitas ilhas, que se conectam entre si por pontes brancas. Entre essas ilhas, há pequenos ribeiros e cursos de água. Como rapidamente para chegar ao Hupisaaret de Helsínquia? Por via aérea 1 hora, de trem cerca de 5 horas e 25 minutos, de ônibus 8 horas e de carro 7 horas. Bem-vindo a caminhar conosco através das minhas fotos. A minha esposa irá mostrar-lhe o caminho certo, para que você não vai perder. White bridges in summer / Puentes blancos en verano / Ponts blancs en été / Pontes brancas no verão . Thank You for Your praising comment. Obrigado! Também lhe desejo uma ótima semana! Gracias a vos por tus muy buenas palabras hacia mi blog. Thank You loving my post. Je vous remercie vivement pour votre si gentil commentaire. que c’est beau! magnifiques photos, matti! la neige et ce ciel bleu, c’est superbe! bravo! ce sont des ponts en bois, il me semble? Merci beaucoup car ce sont des mots qui font chaud au cœur! Oui, ils sont en effet en bois. 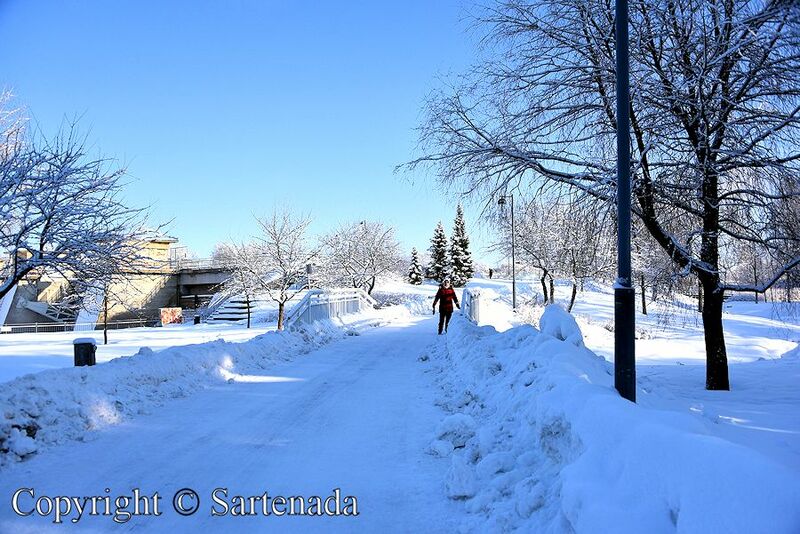 The stunning blue sky and snowy landscape are wonderful photos. I also want to walk in this scenery.Have a good day! 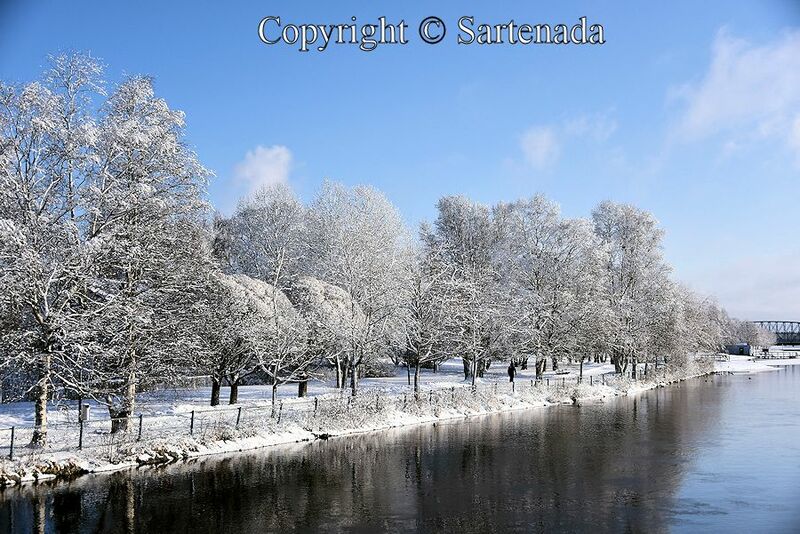 They are beautiful views of winter! 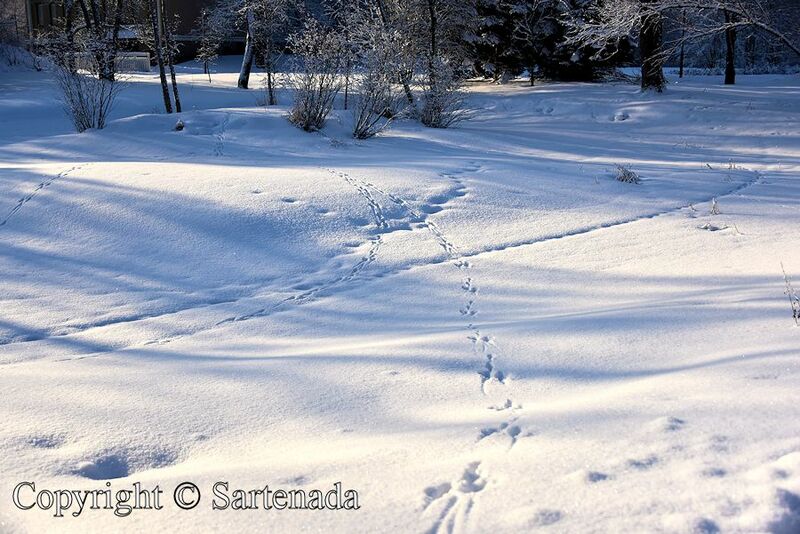 I’m grateful your wife can show us the paths 🙂 My husband and I wish you both a happy winter. I am glad that You loved my photos. Than You commenting so nicely. Uau, lindas fotos! Um ambiente de paz e comunhão com a natureza. As pontes estão pintadas em branco ? Obrigado para o seu gentil comentário. As pontes madeira estão pintadas em branco, sim. No verão, este é um lugar bonito. 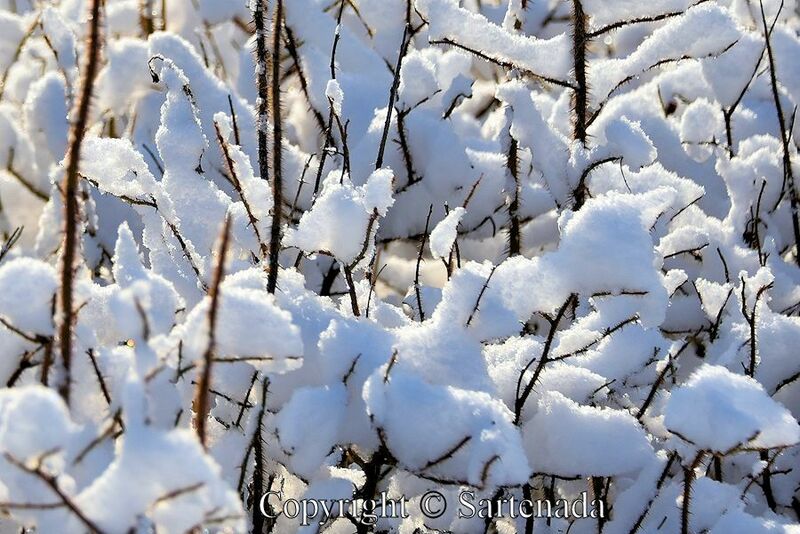 Such beautiful photos of the Oulu countryside Matti. 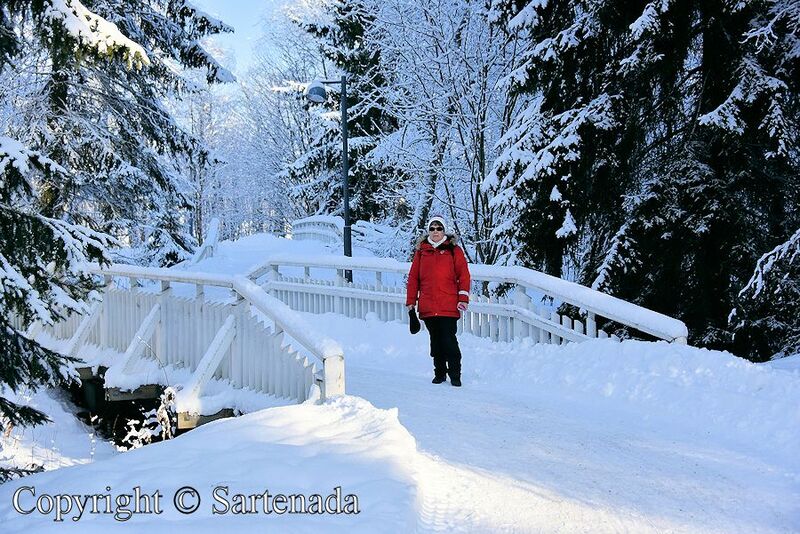 I’ve just returned from snowy Tampere and had lots of fun but sadly I never saw the sun! Thank You for Your kind comment. Well, recently our weather was divided in two parts. In the south, cloudy and snowfall, but in Lapland in here in the middle of Finland (Oulu), it was cold and windy nearly during two weeks. What wonderful paths, with your wife I didn’t get lost but followed her all the way. 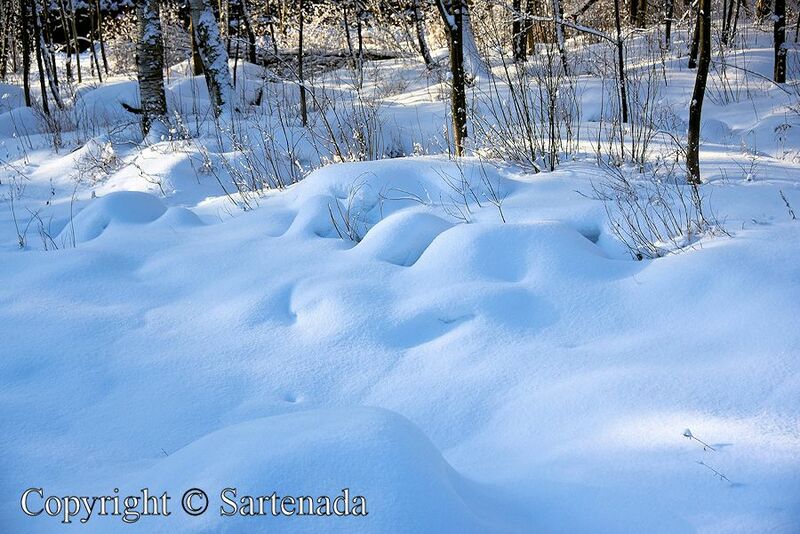 It looks like a fairy tale forest with the snow delicately balanced on all branches. So wonderful with the blue sky! I can only remember one time when I saw a forest like this and it was in Switzerland and my dad and me went cross country skiing through it at -18 degrees. It was a most amazing and wonderful experience. Thank You for Your praising comment. 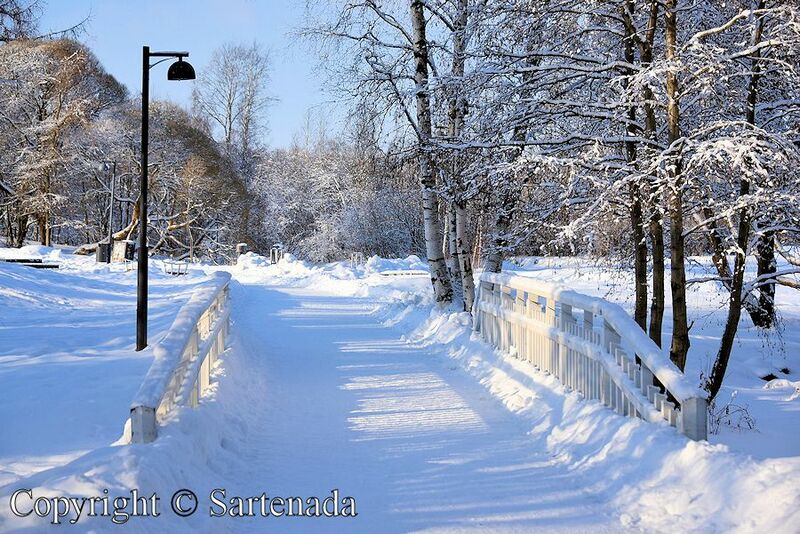 It sounds amazing, but this is in the middle of Oulu. 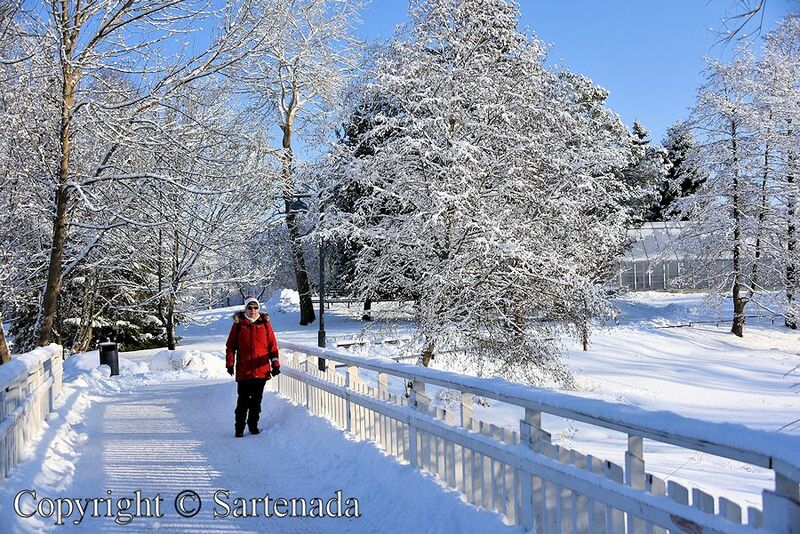 We have had here in Oulu cold, windy and sunny weather – so we are lucky. 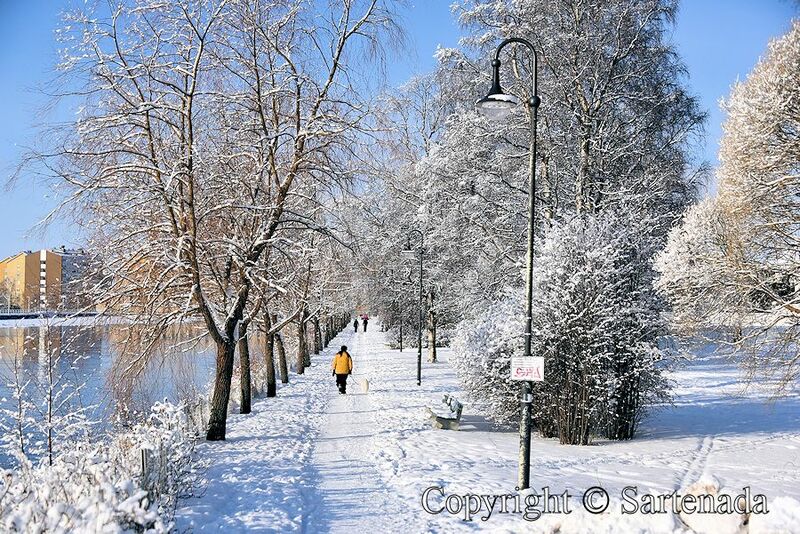 Oulu is underrated and I have sown it in my many Oulu posts. So pretty! I love how crisp the snowy trees look. Amazing shots! 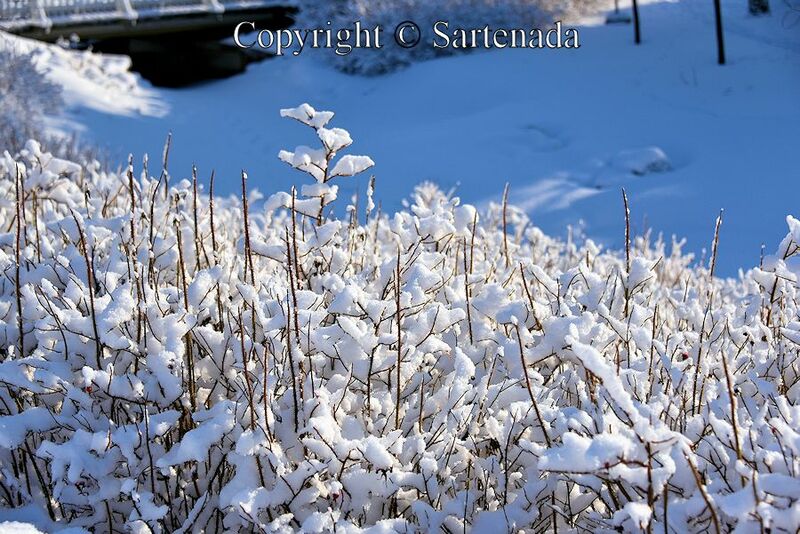 Winter is beautiful and snow reflects its beauty. Thank You. 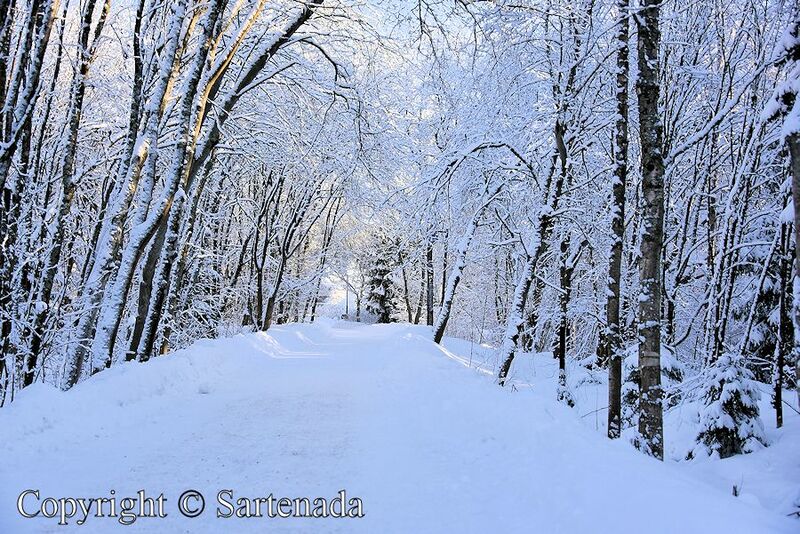 This snowy landscape is absolutely gorgeous, and your photos capture it beautifully. Thanks for sharing your visit with us. 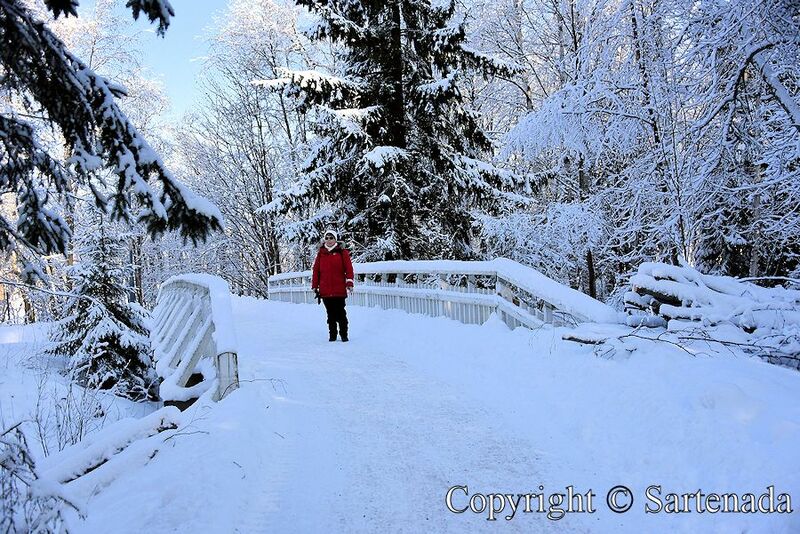 I am glad that You loved the scenery in Oulu. This area is popular place to visit and to enjoy its beauty, was it summer or winter. Thank You. 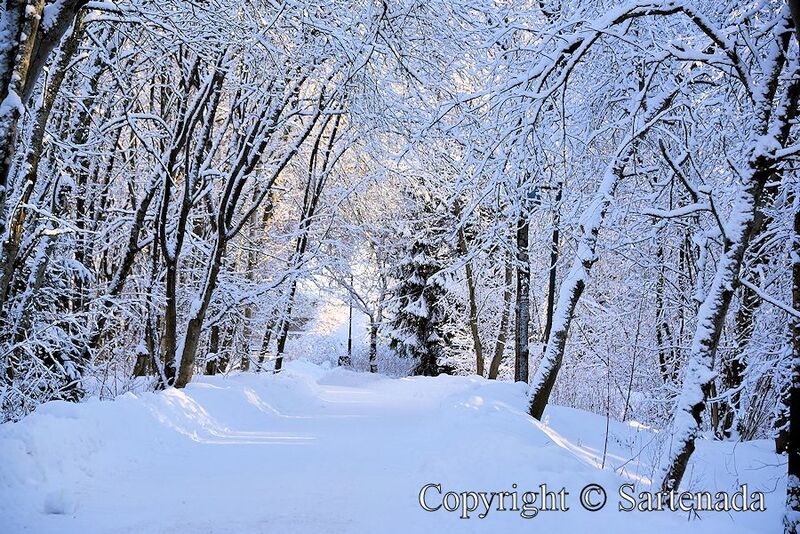 Wow, a beautiful winter wonderland! Thank You for Your praising words. 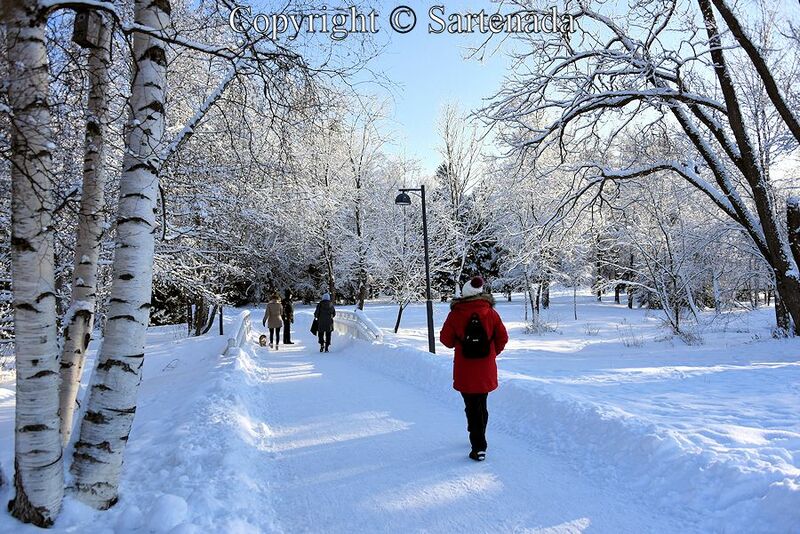 We love this place, because it is in the centre of Oulu, easy to reach and it is beautiful. 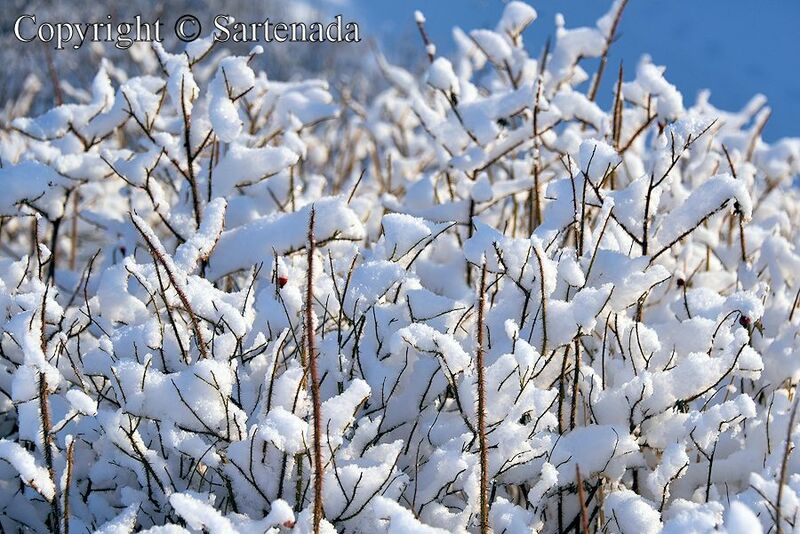 The nature is more beautiful in summer, but in winter, snow reflects its beauty also. How beautiful landscape in white and blue! I am glad that You left Your kind comment here. Thank You. 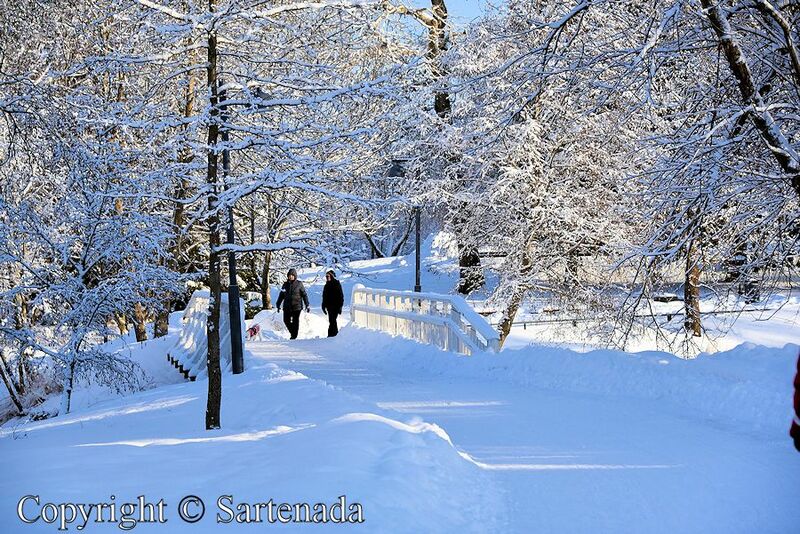 It looks like the perfect winter day! Thank You. It was indeed the perfect day to stroll around this area. 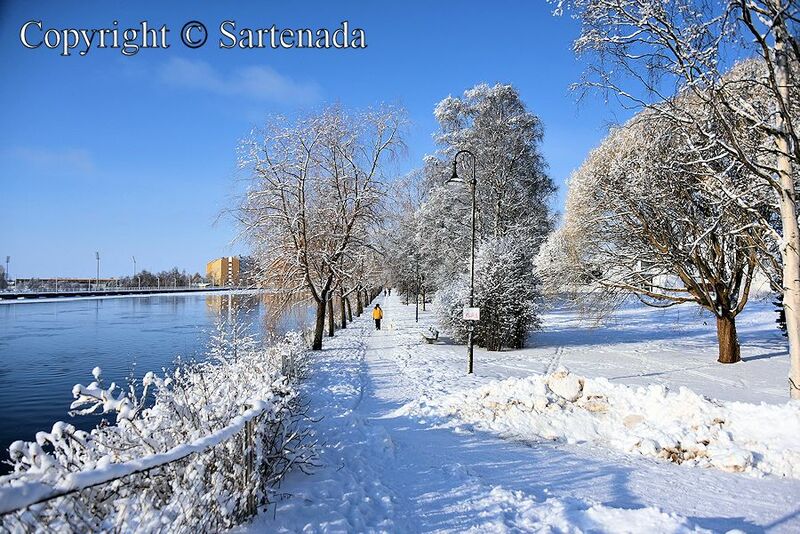 It is one of our favorite in Oulu. Oh Matti, how beautiful. And so different from here, where we are in the middle of another summer heatwave with temperatures hitting the high 30sC and low 40s. I love how the white has so many varieties of shade and colour, and the blue sky is gorgeous. You have hot according to my measurement. 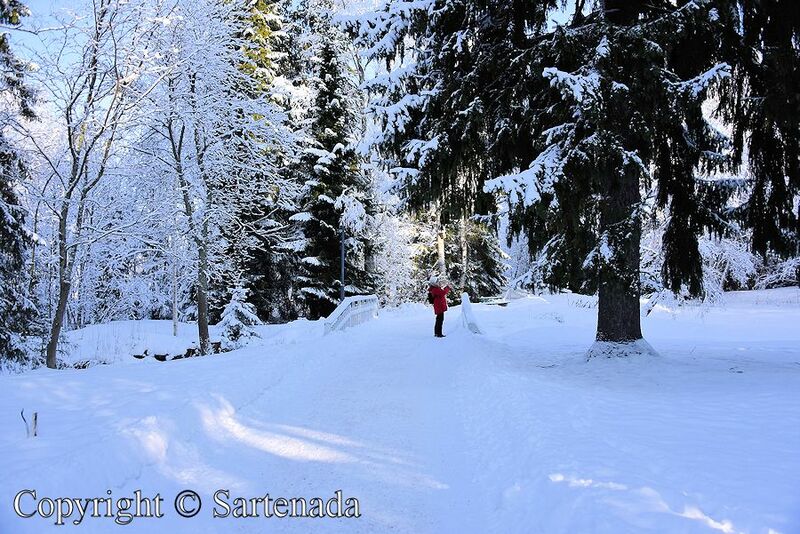 Highest temperature in Finland has been 37.2 °C (2010) and lowest -51.5 °C (1999). 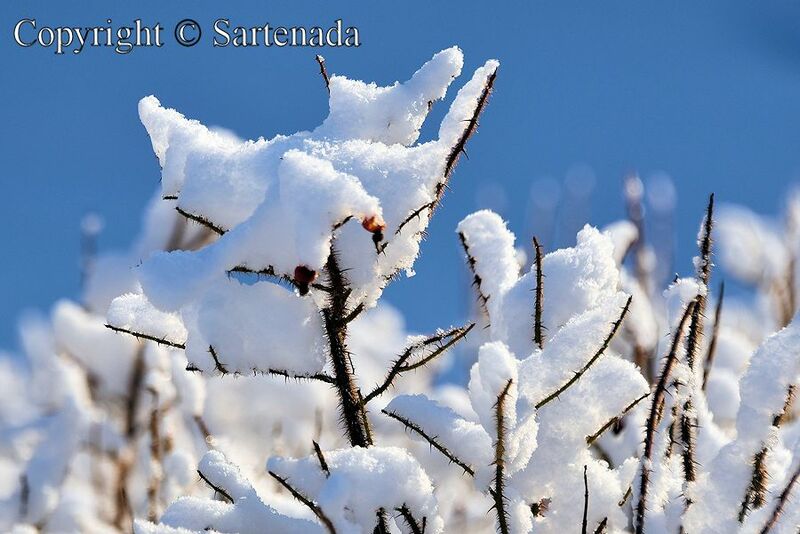 It is amazing that pure white snow has many color varieties indeed. Thank You for Your kind words. The photos are wonderful. Such beautiful landscapes. Thank You loving my photos. The area in in the center of Oulu. 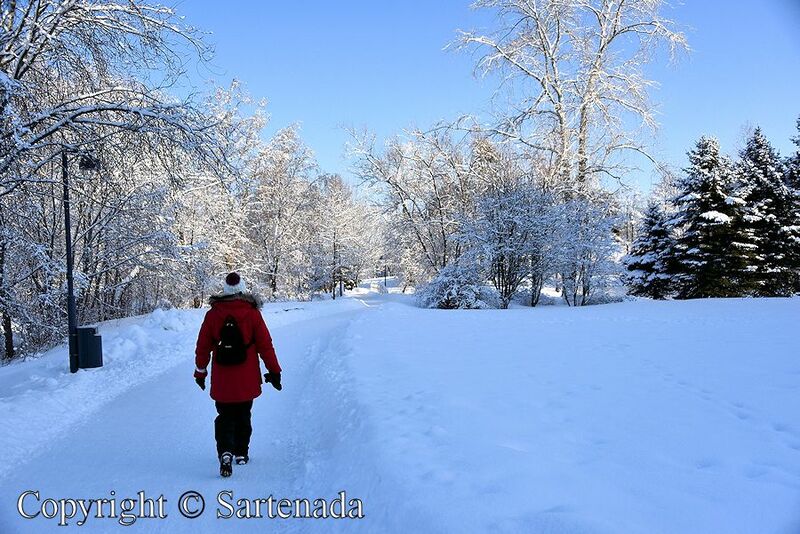 It is wonderful recreation area in both winter and summer. Thanks for letting me know where these photos were taken. Thank You commenting and making a question. Now we do not have. 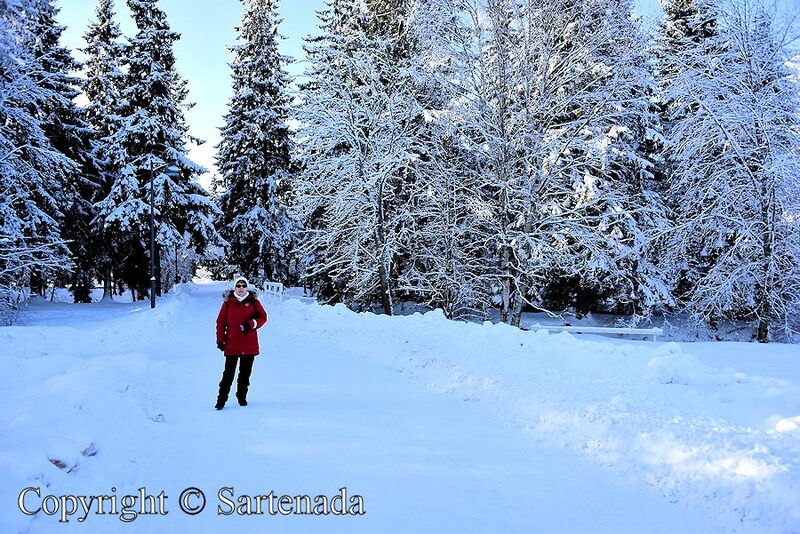 Snow last on ground long time until summer in those northernmost parts in Finland. In summer, sun never sets and it is awesome experience. Many tourists have problems to sleep, because they do not know if it is day or night. I wish, that these xamples tell You better than my words about our climate in the north. I so enjoyed these older posts, your country is so beautiful! I love the rugged country would be so delightful to visit,and camp in a little cottage. I would probably be one of those tourists who couldn’t sleep right.. going to bed with the sun shining would be so different . Thank you for taking time a answer a question. Thank You. Nightless night is a real experience in midsummer. I wish that someday You could experience it. Even here in Oulu, which is halfway of Finland, the night lasts only about two hours and the night is not black. Everything is visible outside and inside quite clearly. Thank You for Your kind words. I am glad that You loved my photos. ¡ Que preciosidad !!! Fotos y sitio espectacular. Sin duda un dia estupendo en ese mágico e impolutamente blanco espacio. Me alegra saber que te han gustado la entrada, muchas gracias. Nos encanta el invierno, ¡pero el verano lo más! El paisaje es precioso, todo blanco. 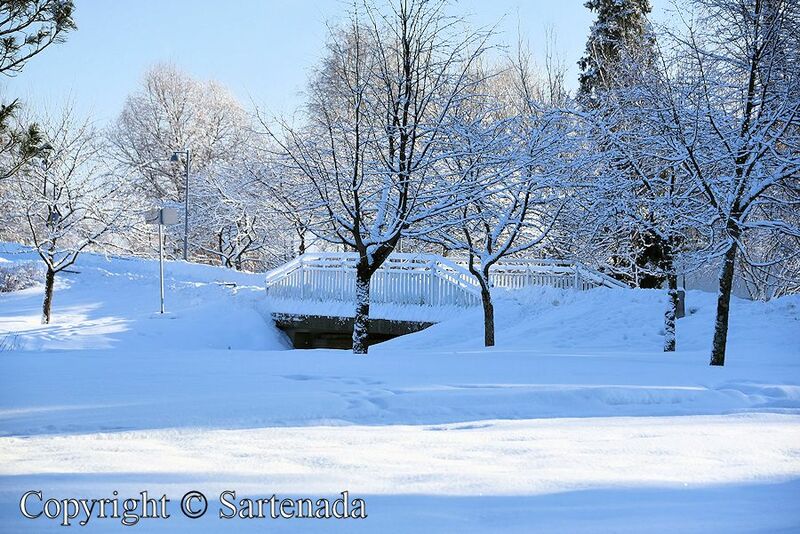 Para los que no vemos la nieve con frecuencia resulta muy espectacular. ¡ Feliz dia para ti tambien!!! Absolutely beautiful, Matti. 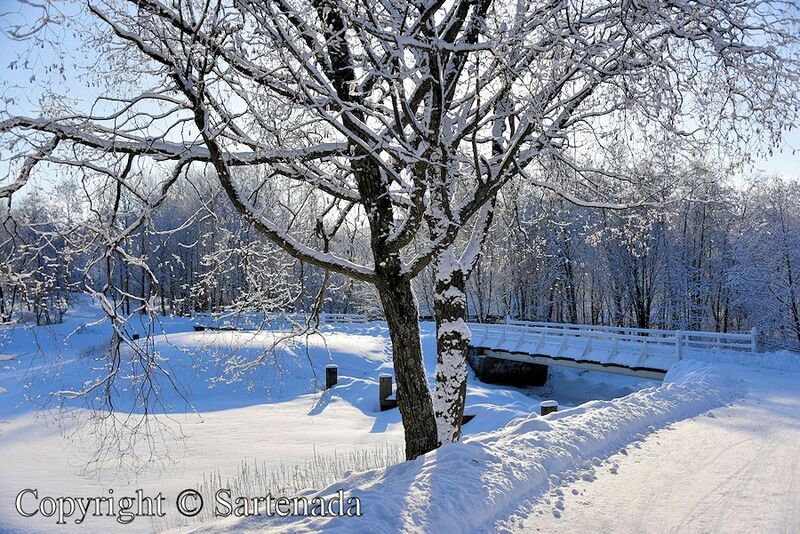 A breathtaking winter scenery and gorgeous photos of the snowy landscape! Hupisaaret look(s) great. Thank You for Your praising comment. 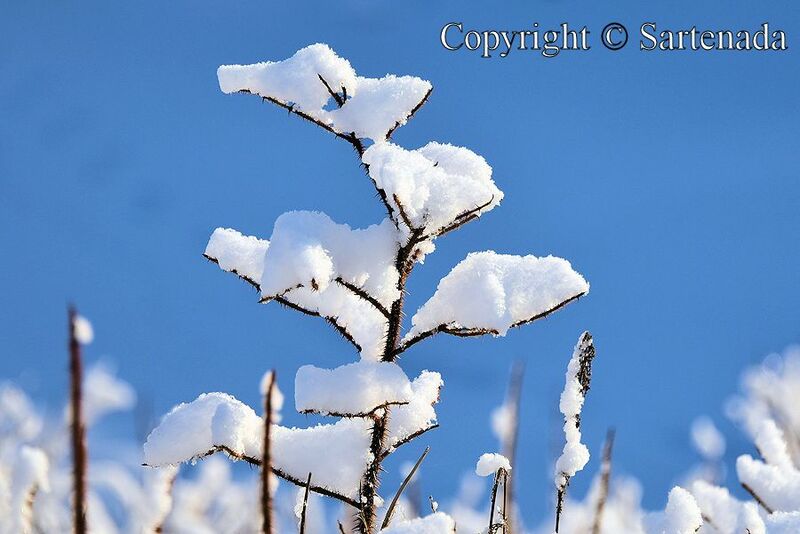 I feel happy to read that You loved my winter photos of Hupisaaret. 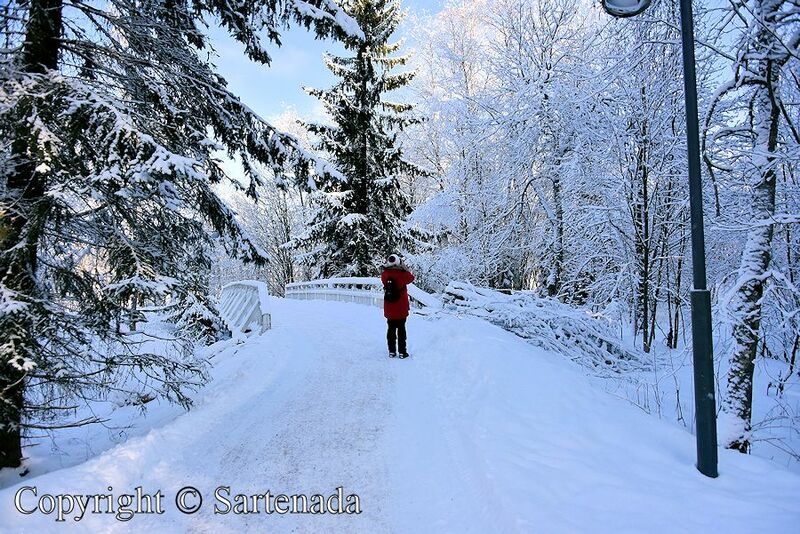 This winter has been cold due to wind here in the middle of Finland, but beautiful. 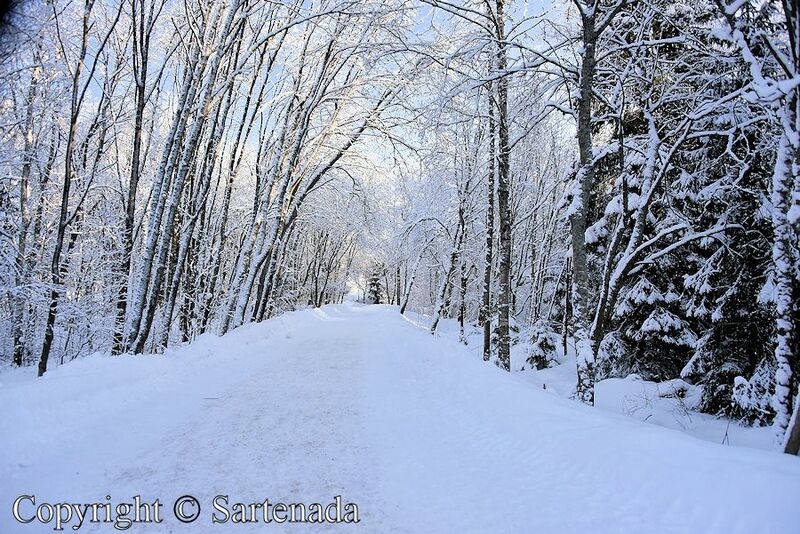 Your photos make winter look beautiful! 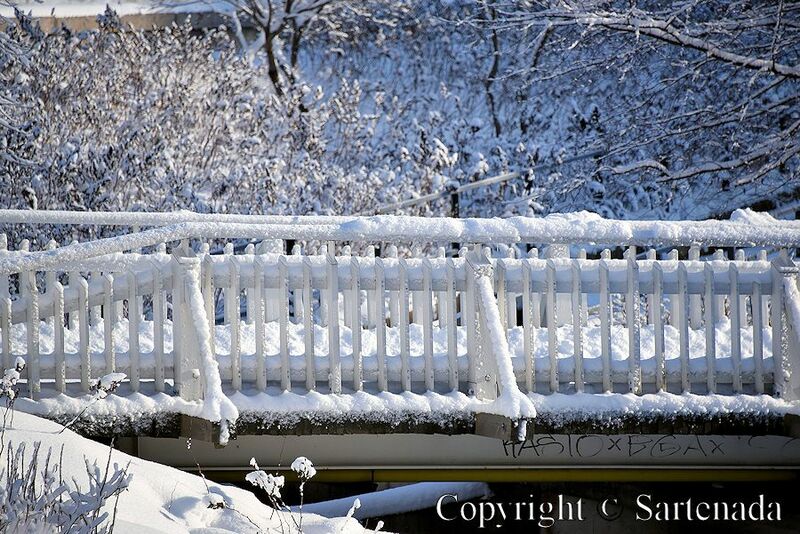 I wasn’t sure at first if the bridges are always white, or only in the winter when covered in snow. 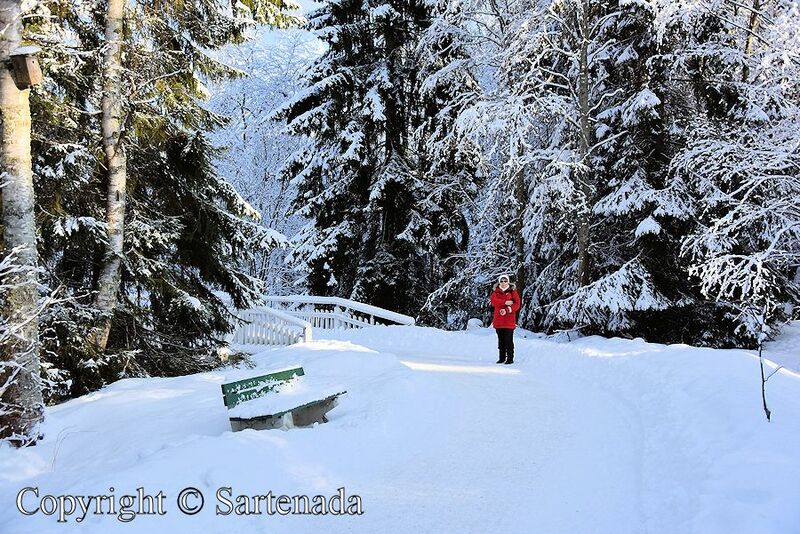 I like that your wife has a red coat; red is my favorite color, and it helps you to not lose her in the snow! Thank you for sharing, Matti! Have a good week. Thank You commenting so nicely. 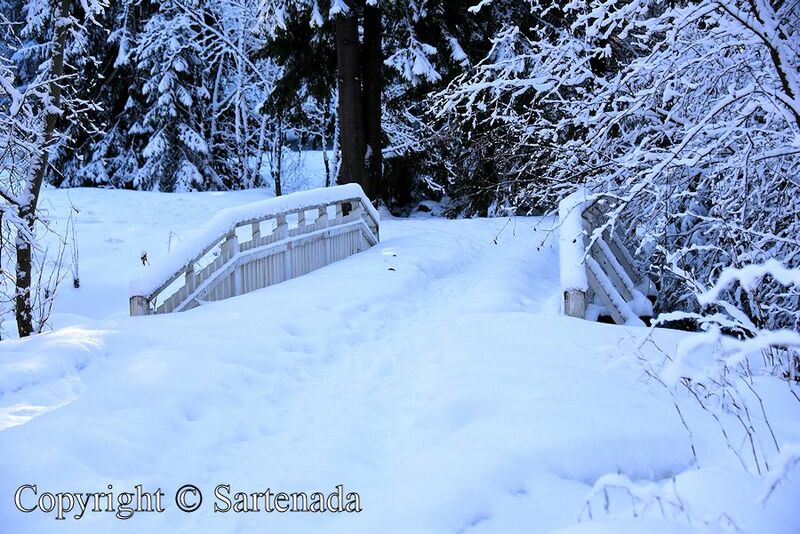 These bridges are white in summer and winter. I had link to summer white bridges at the end of the post. Red is my wife’s favorite. My coat is black, because there was not sale any blue coat. Blue is my favorite color also my car is blue. 🙂 Nearly all my cars have been blue. Happy weekend to You and Yours. Matti. Thank you commenting. I am glad that You loved my photos. All that white, so beautiful! I am glad that you loved my post. Thank You. What’s temperture? I think about -10℃ ? 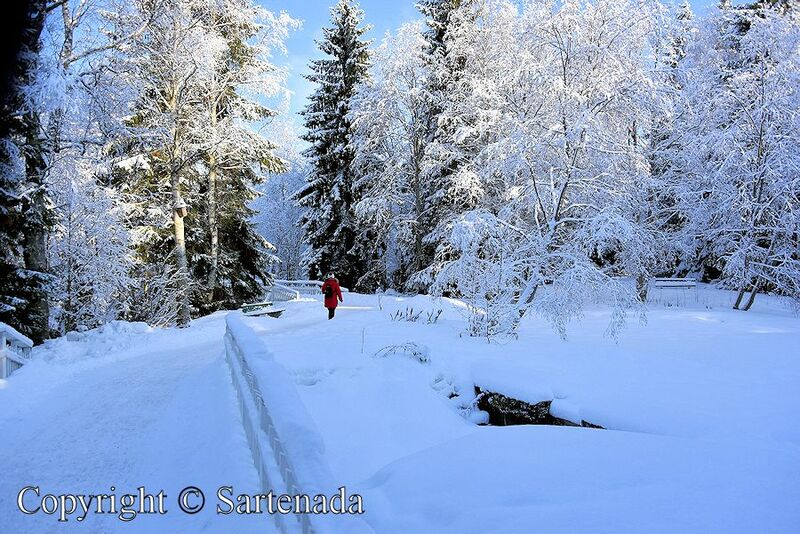 Such magical winter wonderland photos. Thank You. 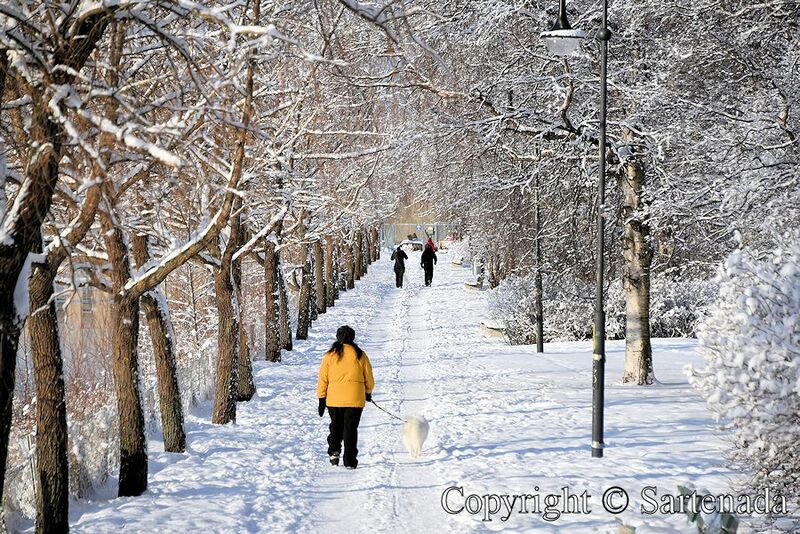 Normal winter photos from Oulu, which is in the middle of Finland. For example, the distance between Oulu and Hanko (southernmost) town is 728km and the distance between Oulu and Nuorgam (northernmost) village in Finland is 719km. Awesome, I think. What a beautiful place! 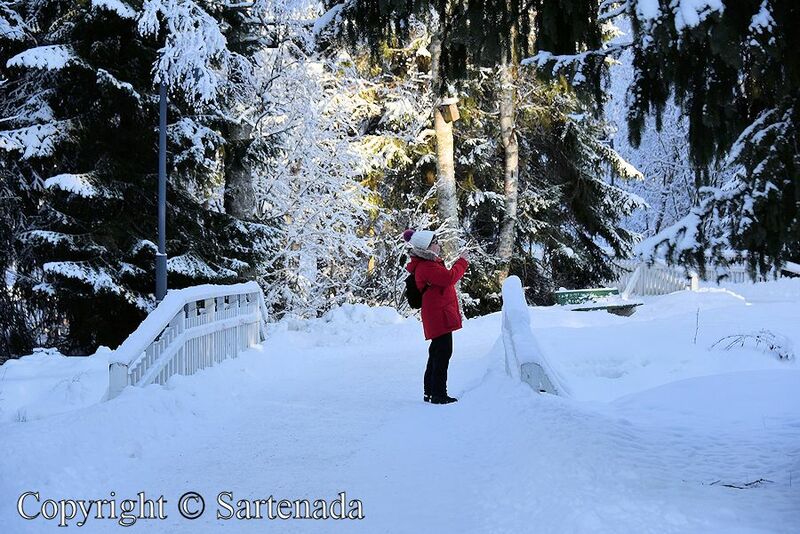 Your photographs are amazing and your snow is the perfect fluffy kind! Thank you. 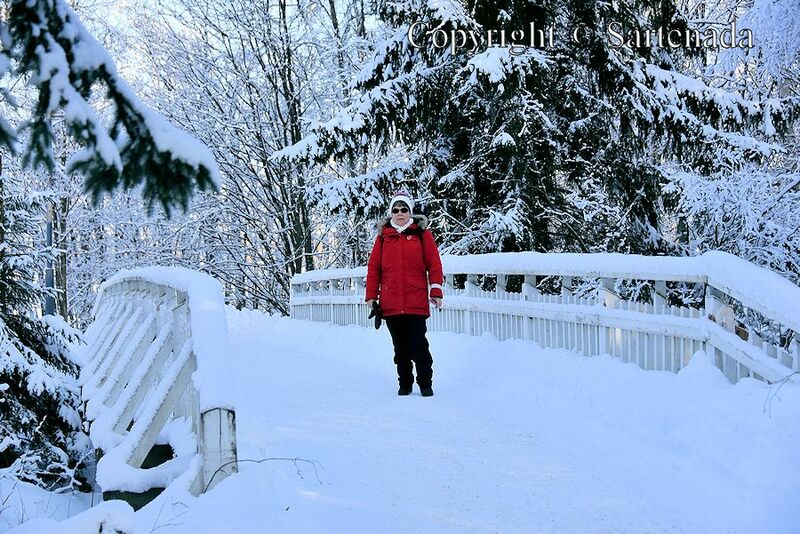 I am glad that You loved my photos from Oulu, which beautiful town. Thank You. Brrr… how cold! 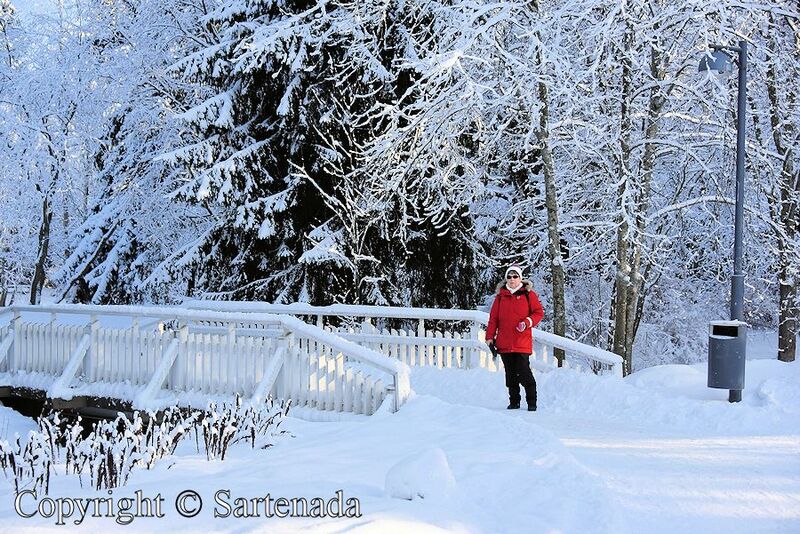 Just looking at the photos, even here in the south, it is not so warm, with the snow that has come back up to 800 m/s. 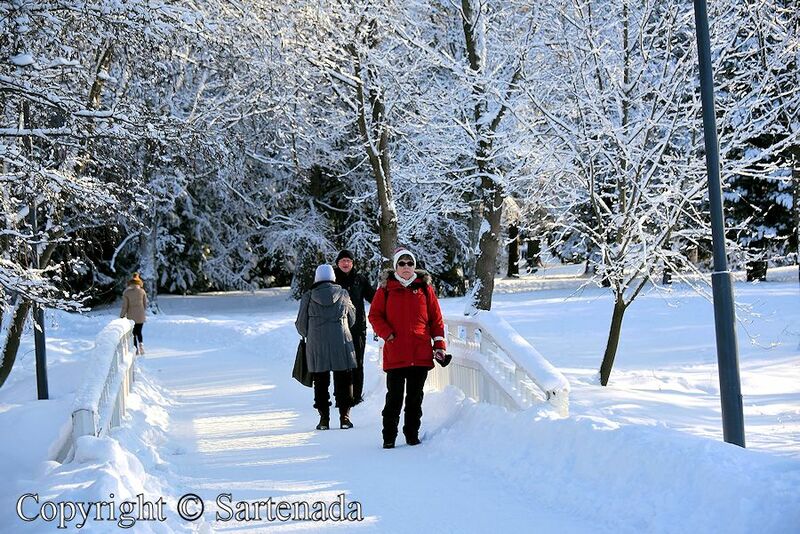 After all, winter is “special” and snow and ice create a fairytale world. How glad I am when reading Your praising comment. 800 m/s, was it avalanche? Thank You. I meant 800 meters above sea level. Actually, just couple hundred meters away from where we live on a side hill… you saw the line of the frozen snow cutting in two the mountain. It is crazy weather indeed, no more 4 seasons, from the cold you spring to warm temperature and vice versa. And people still not believe there is something wrong with the warming up of the atmosphere (greenhouse effect). Thank You vising my blog and leaving Your kind comment. 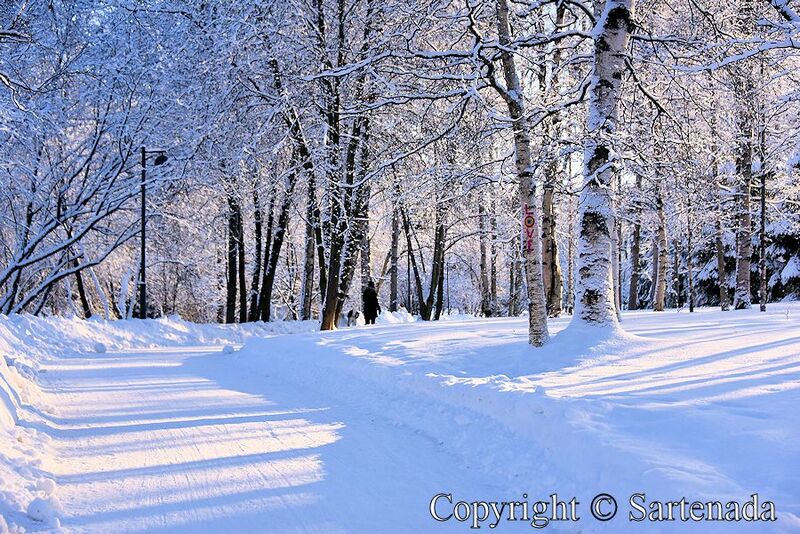 A bright sunny day after a snowfall produces the loveliest landscapes. You captured it so well!! Thank You commenting so nicely. I am glad that You loved my photos. How glad You made, when commenting my blog. Thank You. I am glad that You left Your kind comment and loved my photos. Thank You. Thank You. She wanted to make sure you did not get lost! 🙂 I am glad that You left Your kind comment here. Thank You commenting and loving my photos. Thank You for Your praising comment. It warmed my heart in this cold weather (-19 Celsius). I am glad that You loved my post. Thank You for Your praising words. I like the scenery where snow falls. Thank You. I am sure that You love this small town where I lived few years. All houses are wooden.